Special Offer Special offer of 30% off the list price is available for orders placed through pearson.com.au. Special offer of 30% off the list price is available for orders placed through pearson.com.au. 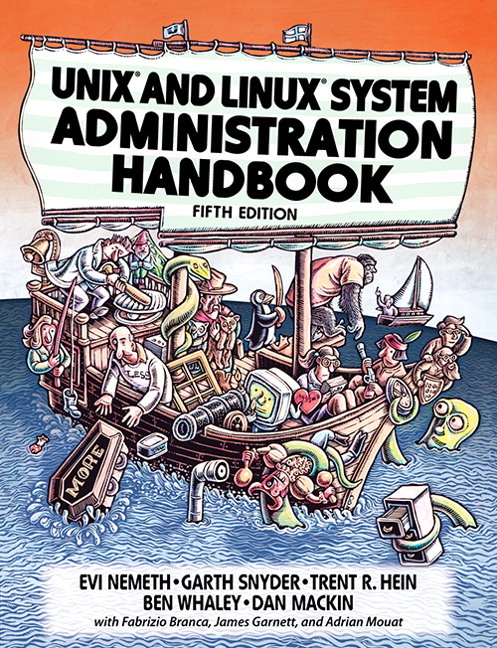 UNIX and Linux System Administration Handbook, Fifth Edition, is today’s definitive guide to installing, configuring, and maintaining any UNIX or Linux system, including systems that supply core Internet and cloud infrastructure. The new Fifth Edition has been extensively revised to focus on today's world of cloud-based systems, application containers, continuous delivery, and highly-detailed monitoring. Pearson 9780134277554 9780134277554 UNIX and Linux System Administration Handbook UNIX and Linux System Administration Handbook, Fifth Edition, is today’s definitive guide to installing, configuring, and maintaining any UNIX or Linux system, including systems that supply core Internet and cloud infrastructure.